A few days ago we had a pretty substantial wind and the last few days while on walks I have found these little bird nests that blew out of trees. I think I will put them in a plastic bag and put them in the freezer for a few days to kill any critters living in them. I'm imagining them as fantastic hats for dolls. On another note, I am moving from Virginia to western Wisconsin, which is a bit overwhelming of a task, so I will be occupied with packing, loading and driving all of our stuff so may not be posting for a bit. Unless, of course, I find something really interesting while going through this process, I'll grab my camera and find wi fi somewhere. I was looking at some blogs the other day and saw some posts that had works in progress and just from looking at them I learned a lot. So, I thought I would post my latest WIP. 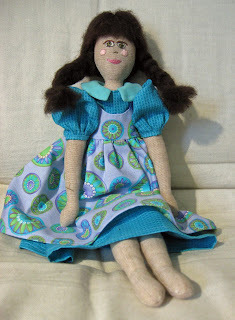 This doll was started over two years ago (cringe) and she is slowly telling me what she needs. This is the first time I tried putting imagery on the skirt section (I've been calling it skirt-scaping). 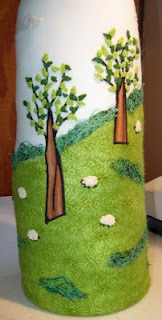 First I traced the body on fabric and machine appliqued the green grass fabric and tree trunks on it, then sewed, stuffed and closed it. 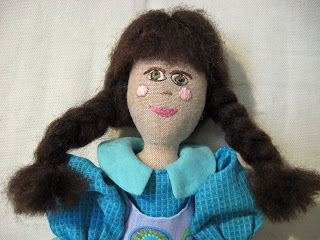 I always embroider the face on another piece of fabric and applique it on to the head. Here you can see the face in progress. 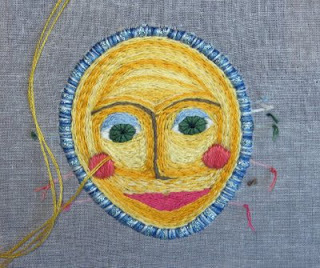 I used variegated thread for most of the face, something I've never done before. I'm not sure about the way it turned out, I may go into it with more solid colors to even it out a bit. The idea was for the face to be the sun shining down on the field. 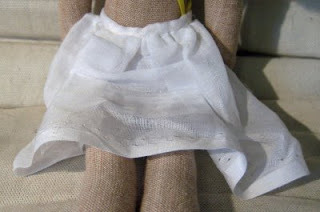 The embroidery on the skirt was done after the piece was stuffed. 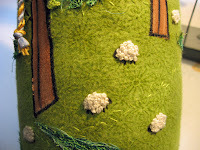 The tree leaves are detached buttonhole stitches, a form of stumpwork and the sheep are french knots. 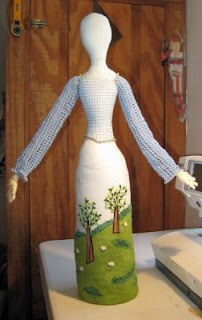 The bodice is made with continuous rows of blanket stitch and the sleeves are crocheted. 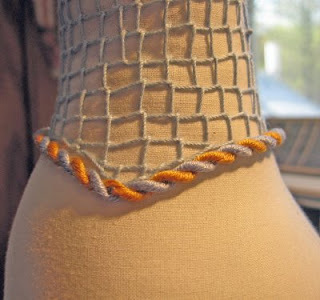 I am testing out twisted cord as a finish for the bodice neck and waist. I know I have further to go, but I don't think it will take another two years. I'll post it when it is finished! My friend Connie at The Spin Cycle recently told me about one of her favorite websites that I am infatuated with...well, not the site really, but what they do. 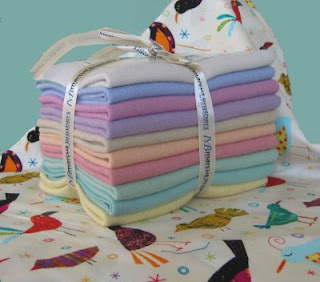 Spoonflower is a company that allows you to upload a design and they will print it on fabric for you. 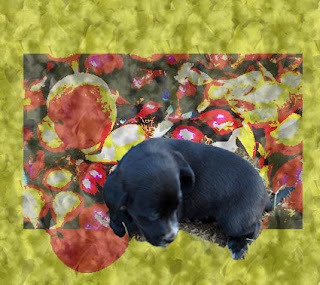 You can determine what type of repeat you want and how much fabric you want to print (from a swatch to a three yard length) for a fairly reasonable price ($5 for a swatch, $11 for half a yard, $17 for a yard). They print on high quality quilting cotton, but it sounds like they are experimenting with upholstery weight and it might be added in the future. I know I'm going to be dreaming up design ideas so I can try this out. Go check it out for yourself. I am getting ready to move to Wisconsin in the next few weeks and so have been trying to see my friends as often as possible before departing. Today I had my friends Susan and Connie over and Connie gave me these amazing gifts. 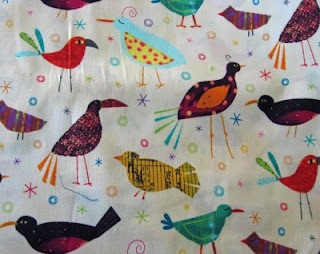 She has an online fabric store called The Spin Cycle and when I was at her house one day saw this great bird fabric. 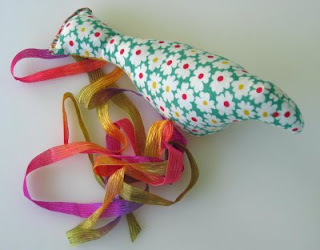 She wrapped the package with the fabric, put this sweet bird on top and tied it with beautiful ribbon. Inside was a stack of felt in amazing colors. I was drooling. What a special treat. Thanks Connie! 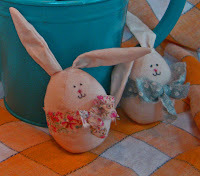 This morning I was trying to figure out something to blog about and I saw these cute little bunnies. 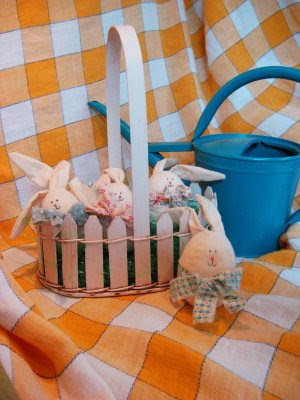 As I pondered, I realized I didn't want to write about the bunnies themselves, since I made them about 15 years ago from a pattern, but rather about the act of making. 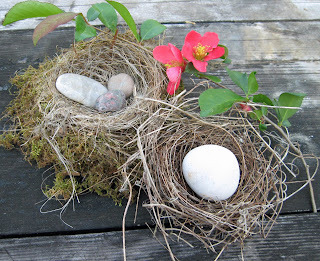 I think it is delightful to look around my home and see my little creations. I often take them for granted because I have been making things for years, but if they were missing, I would be missing. These creations are invaluable because if I found something exactly the same in a shop (A) I would never be able to afford it. You know how much time goes into these objects, or (B) I could afford them, but they would have been made in third world countries under sweat shop conditions. That wouldn't be very good karma! This doesn't even take into account the pleasure I get from the act of making them. 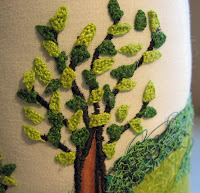 Embroidering puts me in a meditative state and trying to figure out how to make a pattern takes me away from the more difficult aspects of my life. 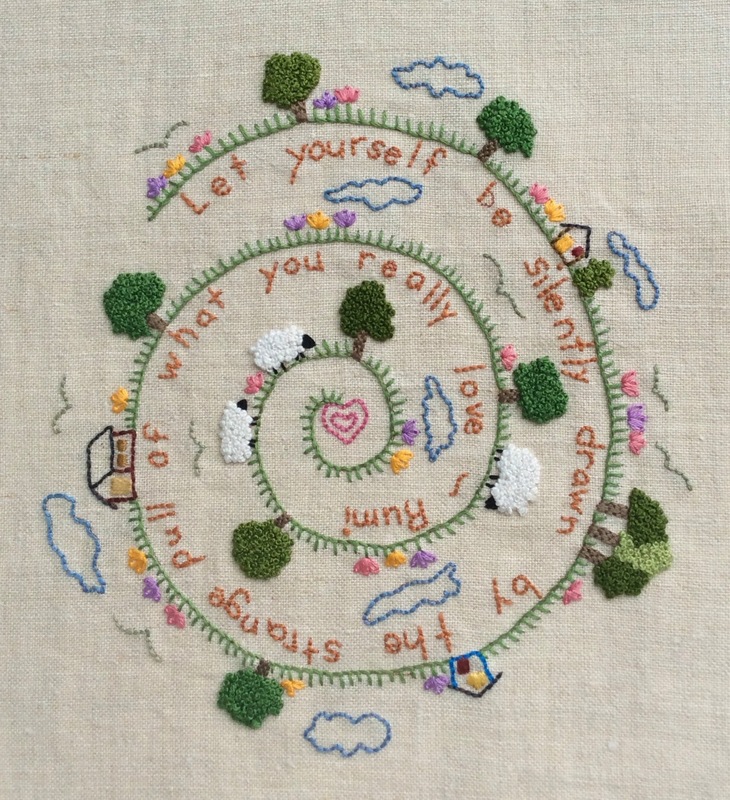 So, take joy in your creations whether it is a quilt, a new garden or your lunch. Put that lunch on a pretty plate just for the fun of creating a beautifully composed picture. Hey, photograph it before you eat it!!! 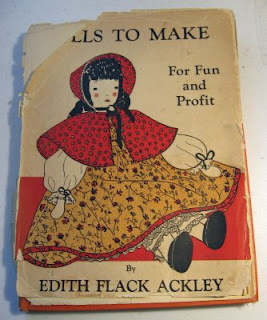 Several years ago a friend of mine gave me an old book called "Making Dolls for Fun and Profit" by Edith Flack Ackley, the publication date is 1938. 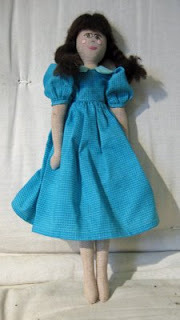 It had been sitting on my bookshelf gathering dust for sometime, but a few weeks ago I was inspired to get it out and make a doll from it. I had a blast. It was fun to make, but I think I can alter the body pattern a bit to make it even easier to sew and put together. 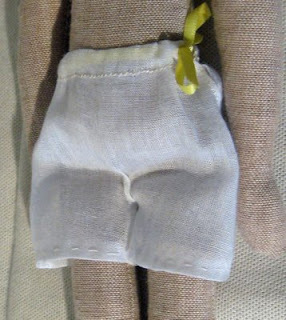 I know this would not make the doll historically accurate, but sometimes ya gotta do what ya gotta do. I might make a few and put them up on etsy. I'll let you know if I do.